The bacon, lettuce and tomato sandwich, usually shortened to its acronym “BLT,” is easily one of America’s all time favorite sandwiches. The transformation of this classic into a savory salad is a short leap, especially with warm summer days upon us. 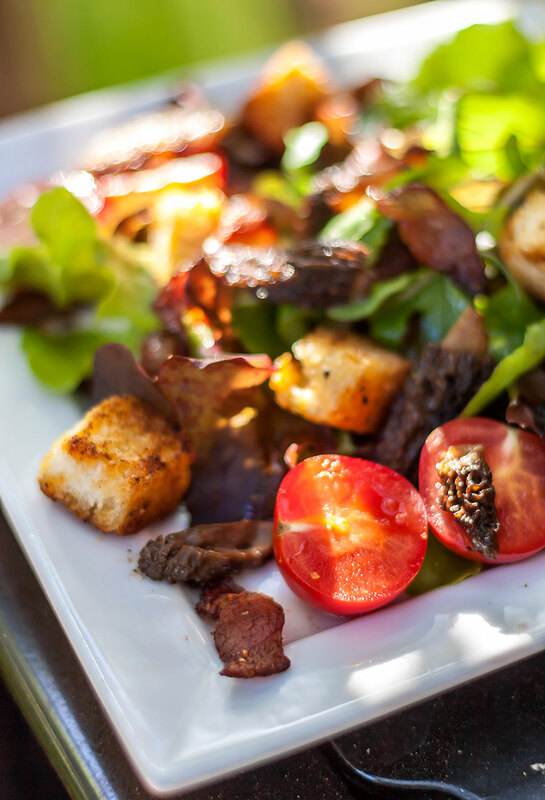 Incorporating all of the ingredients of the BLT (with a couple of mouth-watering additions), this salad is quick and easy to make, minimizing time in the kitchen. Morels are not typically found in a BLT, but we find it hard to resist including this delectable mushroom wherever we can. With the season for fresh morel mushrooms quickly winding down, dried morels make an excellent substitute, adding an unexpected layer of smoky-earthy flavor that blends perfectly with the other elements of the salad. 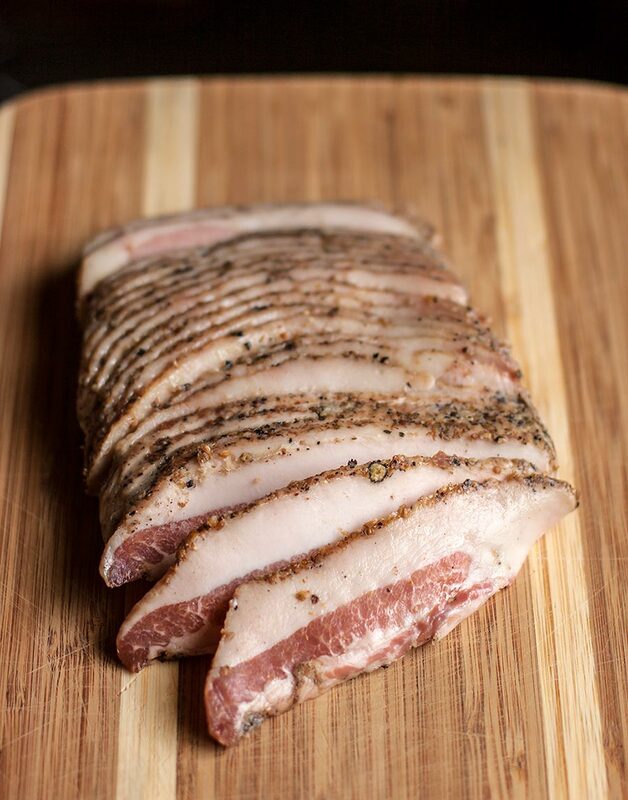 The jowl bacon we used comes from Smoking Goose Meatery, located in Indianapolis, Indiana, an area well known for the production of quality pork. For the uninitiated, while jowl bacon looks and tastes much like “regular” bacon, it also differs significantly in several ways. Taken from the lower jaw of the hog rather than the belly, jowl bacon has a firmer texture that gives a satisfying resistance to the tooth. It’s also substantially meatier, and it has a compact oval shape that makes it a versatile cut with many uses. The base of the salad can be any type of lettuce that you want, but we used a blend of young spring greens, including peppery arugula, that stood up well to the warm dressing and make their own bold contribution to the fusion of flavors in this colorful salad. The warm bacon dressing, made with an unusual ramp-infused vinegar, pulls this delicious salad together. 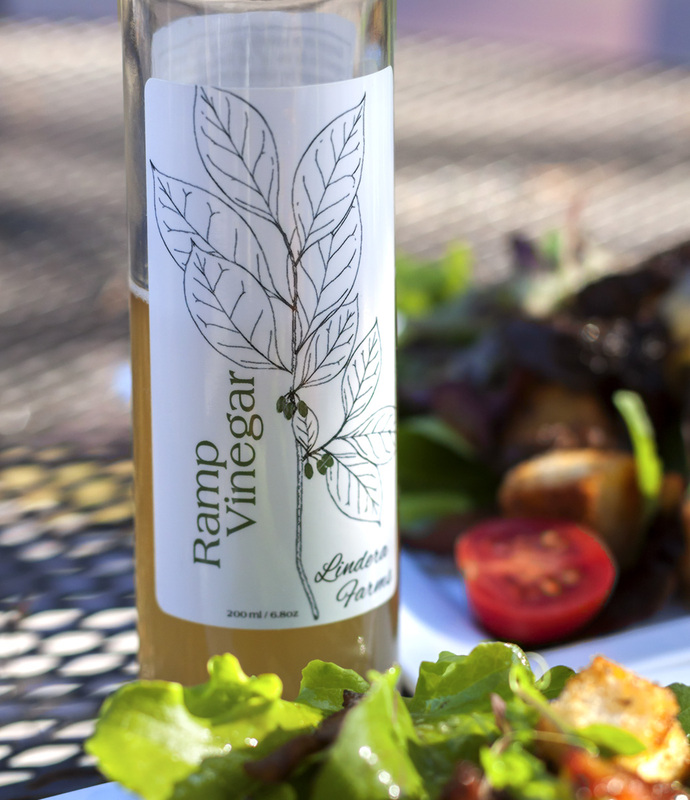 Ramp Vinegar from Lindera Farms is a small batch, artisanally produced vinegar infused with the inimitable flavor of ramps, also widely known as “wild leeks.” The sweet and sour dressing, which incorporates the delicious rendered fat from the jowl bacon, couldn’t be easier to make, taking only a few seconds to whip up, just before the salad is served. Reconstitute the dried morels by placing them in a bowl and covering them with very hot water. Allow to steep for 20 minutes, then drain, reserving the soaking liquid for soups or sauces. Rinse the reconstituted morels gently under cool running water to remove any traces of grit or forest debris. Drain again and pat dry. Slice lengthwise in halves or quarters and set aside. Place the sliced jowl bacon into a cold frying pan and turn the heat to medium-low. Once the bacon begins to cook, raise the heat to medium and fry, turning frequently, until browned but not too crisp. Transfer the cooked bacon to a plate lined with paper towels, leaving the rendered fat behind in the pan. Return the pan to medium-high heat and add the reconstituted morels. Cook, turning frequently for 10 – 12 minutes, then remove the morels and set aside momentarily. With the pan still hot, stir in vinegar and sugar until the sugar is dissolved. Keep warm over the lowest possible heat until ready to finish the salad. Just before serving, place the salad greens into a large bowl and pour the warm dressing over the top. Toss well and season to taste with salt and pepper. 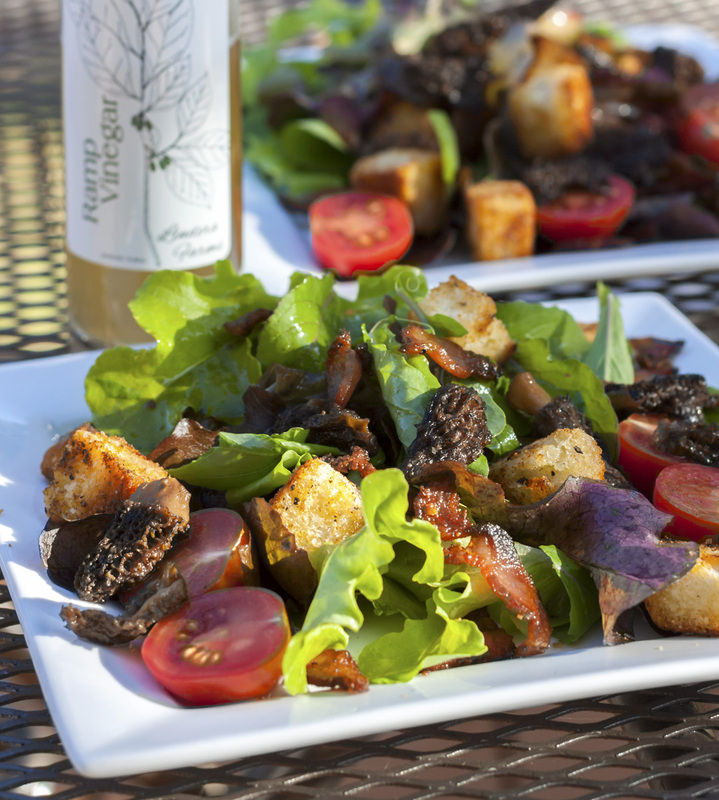 Divide the dressed greens onto two plates and top with the jowl bacon, cooked morels, tomatoes and croutons. Serve immediately.